Swimming is not a flashy sport. There are no touchdown dances, no outrageous slam dunks — you hit the wall first, or you don’t. No. 3 Cal women’s swim stays poised both in and out of the water, and while it does not draw the same crowd as the football or basketball teams, it certainly has far more to show off. Cal is now a perfect 9-0 on the season and is undefeated in conference after taking down No. 9 USC and UCLA this weekend. “We let our work and actions do the talking, we do things with class and that’s very important to us,” said Cal assistant coach Sarah Dunleavy. The Bears slayed the Trojans in their first matchup Friday, 169-131, and the victory had to have been oh so sweet. Not only did Cal hand USC its first loss of the season — leaving itself and Stanford as the only undefeated teams in the Pac-12 — the Bears recorded a road win in the Trojans’ home pool for the first time since 2012. Dominant performances carried over into Saturday where Cal put together an even more impressive defeat over UCLA, coming away with wins in 15 of the 16 events. 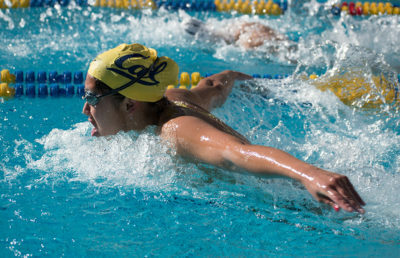 Against the Bruins, 13 different swimmers finished with first-place finishes. The Bears’ flare is kept strictly to the water, as they are swimmers built on a foundation of humility — yet, they have a roster full of superstars. Junior Amy Bilquist wrapped up the weekend with seven total wins out of eight events that she took part in. Against USC, she claimed both the 100- and 200-yard backstroke, hitting the wall hundredths of seconds before teammate junior Kathleen Baker. Katie McLaughlin, a fellow junior, racked up five total wins of her own. In individual events, McLaughlin claimed the 200 butterfly along with the 500 freestyle Friday, as well as the 100 fly Saturday. Cal didn’t only shine with its individuals but also with its four-woman squads, coming out victorious in all four relay events in Southern California. 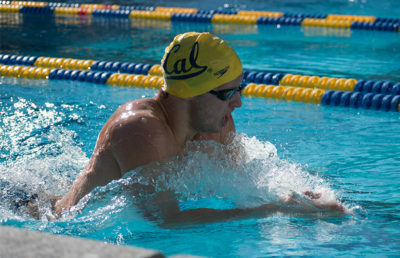 The Bears posted a new record time in the 200 medley relay (when competing at UCLA), finishing at 1:39.65. Baker, Bilquist and sophomores Abbey Weitzeil and Maddie Murphy beat out the previous record of 1:40.04, set in 2014 by a group of Cal swimmers. The meets in Los Angeles were massive successes for Cal, but the Bears have their toughest opponent of the season awaiting them two weeks down the line. Cal will take on rival Stanford in the last meet of Pac-12 play, where the Bears will be an underdog for the first time this season in head-to-head competition. “We’re going to need to be able to compete with (Stanford) in March, so being able to have an opportunity to do that before March — and kind of see where we stand and line up and what we can do better from there — will help us out a lot,” Dunleavy said.